Pick the best keywords. Make your app relevant. Gain visibility in search. We use proprietary App Store Intelligence technology and exclusive data to make wise choices and select the best keywords for your app. You receive a turnkey ASO solution that includes keyword selection, content authoring and robust reporting. Most apps only rank for 10-15 keywords and search phrases. With Gummicube this can improve 5X - 10X in the first month. After you rank for the best, most relevant keywords and phrases, A/B test your icons and screenshots with real users to improve your click-to-download rate. We've optimized thousands of apps, have the best technology and can save you time while increasing your downloads and revenue. Maximize downloads from your search visibility. 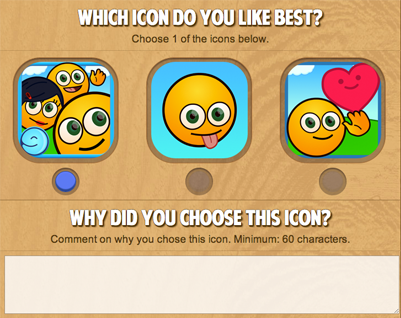 Test your icon and screenshots with real users. Fill out the information below and our team will get back to you right away. Or you can Click Here to send us an e-mail. Get Engaged Users with App Store Optimization and Quality Feedback with Focus Groups. Get more downloads with the traffic you have. Having the right icon and screenshots can increase downloads dramatically! We validate user feedback to ensure that it is high quality and genuine! Creative can include App Title, Icon, Screenshots, and Description. A healthy platform for mobile app discovery. Users are free to leave whatever truthful feedback they wish about an app. We review user feedback to ensure that it is high quality and genuine. We're compliant with Apple T&C's and don't force users to leave a review.